This review is about item#41449231. 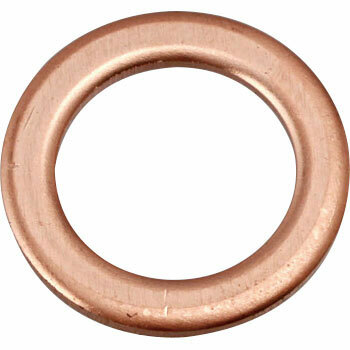 I use it as a normal copper washer in a good sense. "Normal" may not be true for unbranded products. It changed at the time of OH of the brake caliper and master cylinder of address V125. Normal is aluminum, but somehow it feels better because copper has a sense of luxury. Is there a reason for aluminum? I used it for the brake caliper overhaul of the car. The size was perfect and it was very good. I always try to use new things only for brakes. I think that even more numbers can be used. I think that it is good even if there are many number of products. Because exchange is good every time. There is no problem in quality. This review is about item#41449247. The outside diameter of the object of standard size is large and it does not enter depending on the place. Since Kijima's thing has a smaller outer diameter than the standard one, we will enter. However, it is expensive as a unit price. It is cheaper than genuine, but it does not matter at all. It is safe because it is a keiga brand. These consumables need solid products and are helping to reduce troubles. Brake line exchange and brake caliper Overhaul is always used for replacement at the same time Easy to use We use this product with high quality credibility.